HERE IN ORLANDO, FLORIDA, FANTASY AND COLOR CAN BE FOUND NOT ONLY IN ITS FAMOUS PARKS, BUT ALL THROUGHOUT THE CITY. THERE ARE CLOSE TO A HUNDRED THEMED TOURIST ATTRACTIONS HERE. AND ON ONE QUIET RESIDENTIAL STREET, THE HOME OF BARBARA AND NATHAN MCMAHAN REFLECTS NOT ONLY THE BRIGHT COLORS, BUT EVEN SOME OF THE FANTASY THAT MAKES ORLANDO SUCH A FUN PLACE. THE COUPLE’S KITCHEN COUNTERTOP HOWEVER DOESN’T QUITE KEEP UP… IT’S DRAB AND OUTDATED, SO THE MCMAHANS HAVE ASKED ME TO HELP THEM REPLACE IT WITH A LAMINATE COUNTERTOP THAT’S MUCH MORE IN KEEPING WITH THEIR ADVENTUROUS TASTE. Uh, do you have a sample of the laminate? Uh-huh. We have this one. It’s, um, we wanted to go with a slate color, it’s lichen I think is what they’re calling it. Wow, okay. Well that will work really nice with the, with the walls. Yeah we wanted something to kind of contrast it between the cabinets and, and the green. --and make new blanks they call them and then put this on top. We should be able to do it in a day, maybe a little bit more. Let’s get some pry bars and pull this off. All righty. Uh, first thing, let’s take off that backsplash in the back there. 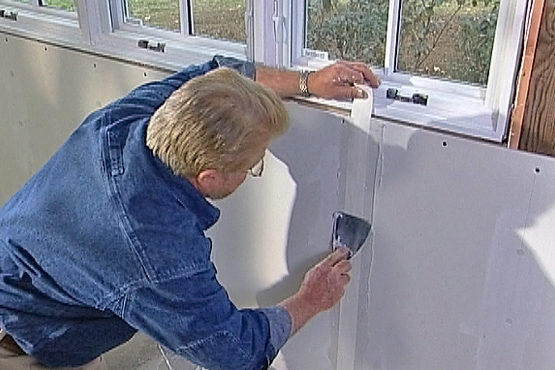 WE START BY CUTTING THROUGH THE CAULK AROUND THE BACKSPLASH TO AVOID DAMAGING THE WALL PAINT WHEN WE PRY THE BACKSPLASH AWAY. WE ALSO DRIVE PUTTY KNIVES BEHIND THE BACK SPLASH TO PROTECT THE WALL FROM OUR PRY BARS. We got our hands behind here, here we go. NEXT, BARB AND NATHAN TEAM UP TO REMOVE THE SCREWS HOLDING THE COUNTERTOP IN PLACE. All right, is it loose? All right. First one out. This thing has probably never been out since the house was built. You are free and clear to navigate. OK, it’s loose, guys, so let’s take it right out. Very nice. We got to go up a little higher. Okay now tip it up this way. All right. I’m going to hand this off to you Nate. Hey, Ron, look what I found in the neighbor’s trash. Yeah looks a lot like your countertop. Oh okay, well I’m glad you got it back ‘cause we’re going to need this all right? --and we’ll trace around this. That will give us a, a blank that’s exactly the same size as the old one. So I can throw this in the street or throw back in the neighbor's trash? Now you, now you can throw it back in their trashcan. Make it into a desk or something? There's our outline right there. USING A STRAIGHT EDGE AS A GUIDE, BARB AND NATHAN CUT OUT THE FIRST BLANK WITH A CIRCULAR SAW. Now you notice that nothing moved when we finished that cut? That's because we've laid out 2X4's under here. And we're cutting through them, or just barely we're, just barely cutting into them. But it means we don't have to be hanging on to this, something's gonna drop as we cut through it. So that's great, guys. Now we just have to make one cut right down through here, and then kind of finish this one off. We'll do that with a jigsaw. NEXT, WE MOVE ONTO THE LARGER, L-SHAPED COUNTERTOP. WELL THE BREAK REALLY ISN’T A PROBLEM. SINCE WE’RE GOING TO MAKE THIS PORTION OF THE COUNTERTOP IN TWO SECTIONS WHICH WE’LL JOIN LATER. AFTER CUTTING OUT BOTH SECTIONS, WE LAY THEM BOTTOM-SIDE UP …BRUSH GLUE ON THE ADJOINING EDGES…THEN CLAMP THEM TOGETHER UNTIL THE GLUE DRIES. We're gonna put this strip along here. This is gonna do two things. It's going to act as a cleat across this joint right here, giving it some strength. But also it's gonna double up the thickness for the edge, because we want an edge that's not three-quarters of an inch thick, but an inch and a half, inch and a half. Right? It's gonna look a lot better. So let's, uh, drill some clearance holes in this first, guys. WHILE NATHAN BORES CLEARANCE HOLES THROUGH THE CLEAT, BARB FOLLOWS BEHIND DRILLING COUNTERSINK HOLES WHICH WILL ALLOW THE SCREW HEADS TO SIT SLIGHTLY BELOW THE SURFACE. NEXT, WE APPLY GLUE TO THE FACE OF THE CLEAT… PRESS IT INTO PLACE… THEN DRIVE IN OUR SCREWS. WE REPEAT THE PROCESS ON A SECOND CLEAT…THEN ATTACH A THIRD CLEAT DIRECTLY OVER THE JOINT WHERE THE TWO SECTIONS MEET. WE CONTINUE BUILDING UP THE BLANKS BY INSTALLING CLEATS ALONG EACH EDGE. NOW WE’RE READY TO CUT THE LAMINATE. WE START BY MEASURING THE DIMENSIONS OF THE BLANKS. So the first one is forty-three and a half. I ADD AN EXTRA INCH TO EACH MEASUREMENT, SO THAT THE LAMINATE WILL OVERHANG THE BLANK ON ALL SIDES. WE’LL TRIM OFF THE EXCESS LAMINATE AFTER IT’S ATTACHED TO THE BLANK. Now this comes in a whole different size, a range of, uh, sheet sizes from three feet wide and six feet long to five feet wide and twelve feet long. Um, I’ve selected four by eight sheets today ‘cause I think we’ll get the most efficient use of those. 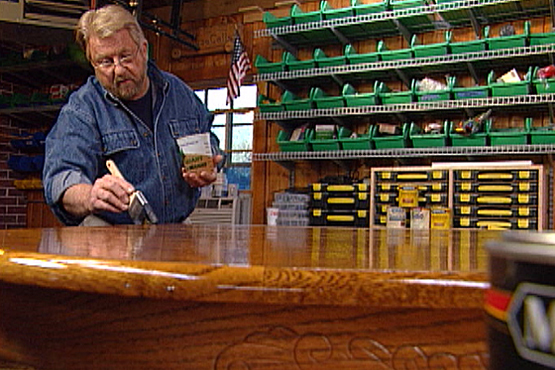 AFTER TRANSFERRING OUR MEASUREMENTS TO THE LAMINATE, WE CUT IT TO SIZE WITH A CARBIDE-TIPPED SCORING TOOL. WE RUN THE TOOL OVER THE SURFACE SEVERAL TIMES TO MAKE A DEEP SCORE. THEN BREAK THE LAMINATE. NATHAN AND BARB CUT THE REST OF THE LAMINATE TO SIZE. WE’RE GOING TO START ATTACHING IT ON THE SIDES OF OUR BLANKS. So we’re going to do that by applying first of all some contact adhesive. 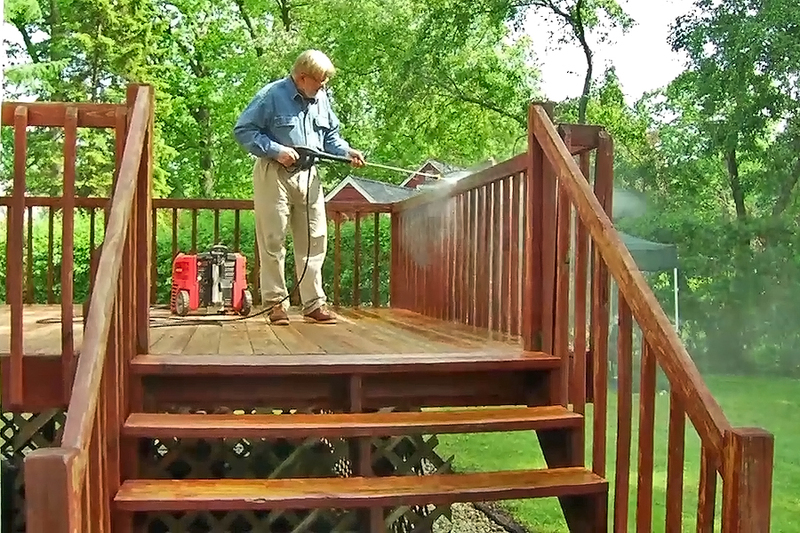 Now I’ve already put one coat on these three surfaces here but Barb if you want to take a brush and put some more on. THIS SECOND COAT IS NECESSARY BECAUSE THE FIBER BOARD IS VERY POROUS. 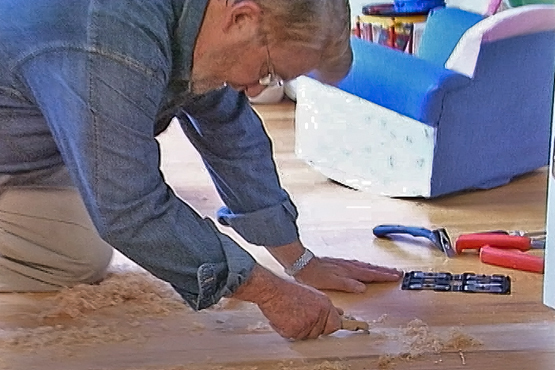 AS BARB BRUSHES IT ON, NATHAN APPLIES CONTACT ADHESIVE TO THE SIDE STRIPS OF LAMINATE. ONLY ONE COAT IS NEEDED HERE. And, interesting thing about contact cement is, you put it on two mating surfaces and you want it to be dry to the touch. And it, so it’s not sticky if you touch it with your finger. So all you have to do right now, remember these are cut oversize so as long as you’re overhanging on all edges, position is not that critical. THESE STRIPS OF LAMINATE ARE GOING ON THE SIDES OF THE COUNTERTOP THAT WILL BE NEXT TO THE APPLIANCES. 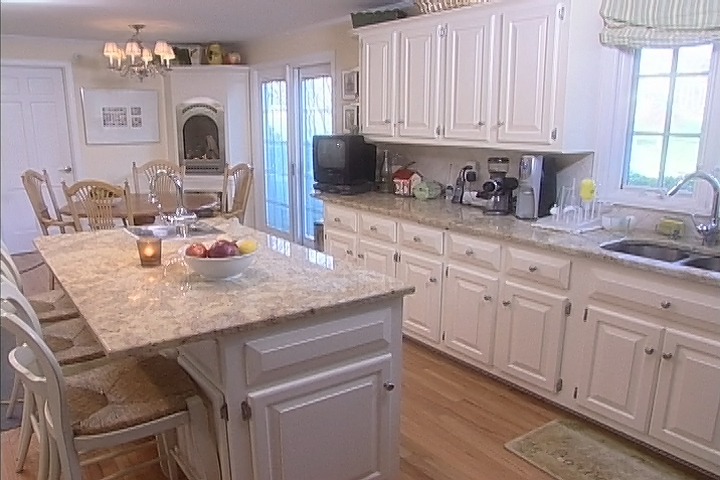 LATER, WE’LL USE A MORE DECORATIVE TREATMENT FOR THE FRONTS AND EXPOSED ENDS OF THE COUNTERTOPS. WE RUN THE TRIMMER ALONG THE SIDES IN A CLOCKWISE MOTION. WHAT’S IMPORTANT HERE IS TO KEEP THE BASE PERFECTLY FLAT AS IT MOVES ALONG THE SURFACE. AFTER COMPLETING THE TRIM WORK ON THE SIDES OF THE COUNTERTOPS, WE MOVE ON TO THE TOP. THIS TIME WE APPLY THE CONTACT ADHESIVE WITH ROLLERS, AND AGAIN, WE USE A DOUBLE COAT ON THE MDF. Now, remember, when we put these in contact with each other, they’ll stick immediately. So what we’re gonna do is put these pie--, these strips of wood down here; just let the end kind of stick out a little bit there, Nate, on that one. SINCE THESE STRIPS WON’T STICK TO EITHER SURFACE, THEY ALLOW US TO SLIDE THE LAMINATE INTO POSITION AND MAKE SURE WE HAVE AN OVERHANG ON ALL SIDES. THEN WE REMOVE THE STRIPS AS WE PRESS THE LAMINATE INTO CONTACT WITH THE MDF. Once you’ve gotten this all rolled out, take the laminate trimmer, and the same way we did the sides, trim the overhang right here, okay? Okay. You can do that. I’m gonna go to bed. All right? And I’ll, uh, leave you guys to this, and I’ll see you in the morning. Like it. I like it a lichen, huh? For more great home improvement ideas, visit me at lowes.com/housecalls. Boy, you guys made some progress. How’d this go? Ah, we just finished it up. IT’S DAY TWO OF MY HOUSECALL AT THE ORLANDO, FLORIDA HOME OF BARB AND NATHAN MCMAHAN WHO, LAST NIGHT, APPLIED THE REST OF THE LAMINATE TO THEIR NEW KITCHEN COUNTERTOPS. WE ALSO APPLIED STRIPS OF LAMINATE TO THE COUNTERTOP EDGES THAT WILL BE ALONGSIDE THE APPLIANCES. THESE, WE SMOOTH WITH A FILE. ...or the end of the countertop, we’re gonna treat differently. We’re gonna put this decorative edge, uh, on the blank that we’ve made up right here. And in order to do that, you notice that there’s a tongue right here on the inside? We’re gonna have to cut a dado or a slot right on the edge right here. With this tool. With a, with a router fitted out with a, a dado bit in here. I’m gonna let go now. Just keep goin’. You’re doin’ great. Just slide it along. Okay, good. Pull it away. There you go. AS WE CUT EACH PIECE TO LENGTH, WE PUT 45 DEGREE MITERS ON THE ENDS, TO CREATE CLEAN CORNER JOINTS. NEXT, NATHAN AND BARB BRUSH GLUE, ON THE INSIDE OF THE DADO, ON THE EDGE OF THE COUNTERTOP AND ON THE BACK OF THE DECORATIVE TRIM. Okay. I'm gonna just push this in now. I think we may have to. All right? Now let's take this piece right here, and we want to pull these together, Nate. Nice and tight, okay? ONCE ALL THE EDGING IS ON, WE MOVE BACK INTO THE KITCHEN TO INSTALL OUR NEW COUNTERTOPS. Very pretty. You've got to like this, huh? Like it. I like a the lichen, huh? All right. You want to attach these down? Here's some screws. Now look, before you go under there, Nate, there's a bracket right here. You see it right here? Same bracket as when we took it off? So you've got to come up through this bracket right here and into the bottom of the shelf. WHILE NATHAN ATTACHES COUNTERTOPS, BARB AND I INSTALL THE BACK SPLASHES. 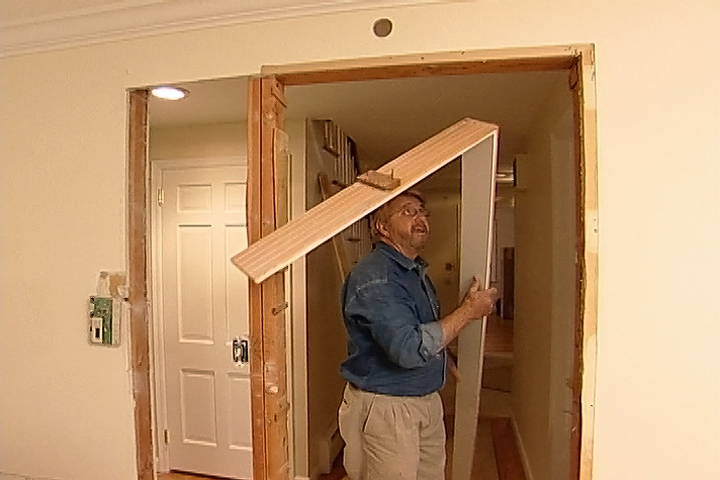 WE START BY RUNNING A BEAD OF CONSTRUCTION ADHESIVE ACROSS THE BACK OF EACH ONE… THEN PRESS IT INTO PLACE. We’ll put this in first, and then put that L-shaped counter on, so that we can bring the counter up to the stove. A little higher. There we go, that’s it. Place it here. WITH THE COUNTERTOP INSTALLED, WE PLACE THE NEW SINK UPSIDE DOWN AND TRACE THE OUTLINE. WE DRAW A SECOND LINE ONE QUARTER INCH INSIDE THE FIRST. THIS WILL BE OUR CUT LINE. 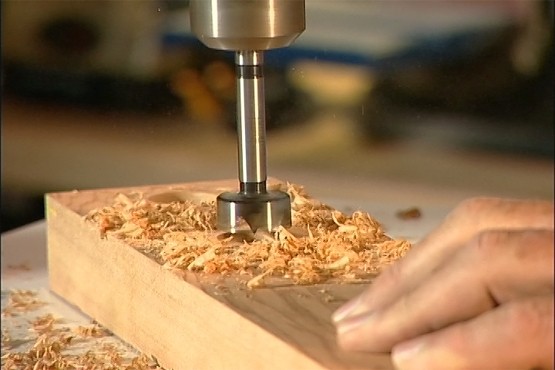 NEXT, WE DRILL STARTER HOLES AT ALL FOUR CORNERS… THEN USE A JIGSAW TO CUT THE OPENING. ALL THE FIXTURES ARE ATTACHED TO THE SINK BEFORE IT’S INSTALLED. THEN A BEAD OF SILICONE SEALANT IS APPLIED AROUND THE EDGE OF THE COUNTERTOP OPENING AND THE SINK IS SET IN PLACE AND SECURED FROM BELOW WITH CLIPS. FINALLY, THE PLUMBING IS RECONNECTED. THE SINK AND COUNTERTOP REALLY HAVE TRANSFORMED THE KITCHEN. It looks so rich and, and, and elegant. And Lichen. Who would've thought Lichen, huh? It's perfect for you guys though. I mean, you've got, you know, so many plants in the house. And this color here, it just, it just, it's you and it picks up a lot of the elements in this room. Well, it used to be so bland. And now it brings out the color in the cabinets and, uh, breaks the room up, gives it three dimensions. Brings out a lot of color in the cabinets, really. Yeah. Yeah. And it makes the room look wealthy. Right. And this edging's really nice, too. Rather than just straight down. This is what makes laminate look like such an elegant material. One of the things. The richness of the pattern. Well, it's been a long day. LAMINATE HAS COME A LONG WAY IN RECENT YEARS AND IF “LICHEN,” ISN’T YOUR COLOR, YOU’LL FIND COUNTLESS OTHER SHADES AND PATTERNS TO CHOOSE FROM AT YOUR HOME IMPROVEMENT CENTER. Build a new laminate kitchen countertop with bullnose edging and replace the sink to update your kitchen decor. Update your kitchen by building a new particle board base covered with attractive laminate with matching bullnose edging. Removal of the entire countertop and sink is required. Replacing the sink with a new stainless steel or porcelain model is no extra work, but it will provide extra value in enhancing your kitchen and bringing it into the current decade. Remove existing countertops, backsplashes, the sink and its plumbing, and below-counter appliances. Use a putty knife, pry bar, utility knife, hammer, and cordless driver, but be careful not to mark the existing walls or tile. Using the original countertop sections as templates, trace their exact size and shape onto 3/4-inch thick medium density fiberboard (MDF). Once the old pieces are traced for the new MDF blanks, they may be discarded. Place two-by-fours underneath the MDF sheet to support it while you use a metal straight-edge as a guide to cut the blanks out with a circular saw. Insets and other shape details should be cut with a jigsaw. Glue the blanks' edges together, clamping them until the glue dries. Working from the bottom, use glue and countersunk screws to secure MDF cleats across joints as reinforcement and along the forward edges to make a double-thickness lip. Transfer the blanks' dimensions to the laminate with a 1-inch allowance to overhang on all sides. Cut laminate panels for tops and thin strips for hidden edges, scoring the laminate with a carbide-tipped tool and breaking it along the score-line. Apply two coats of contact adhesive to the blank surfaces and one coat to the laminate, beginning with the hidden edges. Let the adhesive dry. Position the laminate, pressing each piece firmly in contact with the blank with a J-roller. 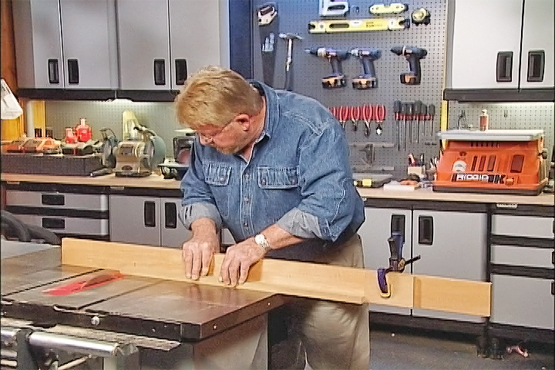 Trim the allowance from the edges with a laminate trimmer/router. Hold the trimmer perfectly flat against the laminate, moving from left to right. Repeat this process for all the top panels. Route a dado into the exposed countertop edges to fit the wooden tongue on the back of the decorative laminate strips and miter the ends for corners. Brush the dado, tongue and adjoining surfaces with glue and press place. Screw countertops to support brackets. Apply construction adhesive to the backsplashes, pressing them into place. Squeeze a bead of white silicon caulking along the backsplash-tile joint, but use clear caulking at the countertop-backsplash joint. Smooth the caulking. Replace the appliances. Tracing the sink upside down along the countertop. Draw a second line 1/4 inch inside the original outline as the cutting line. 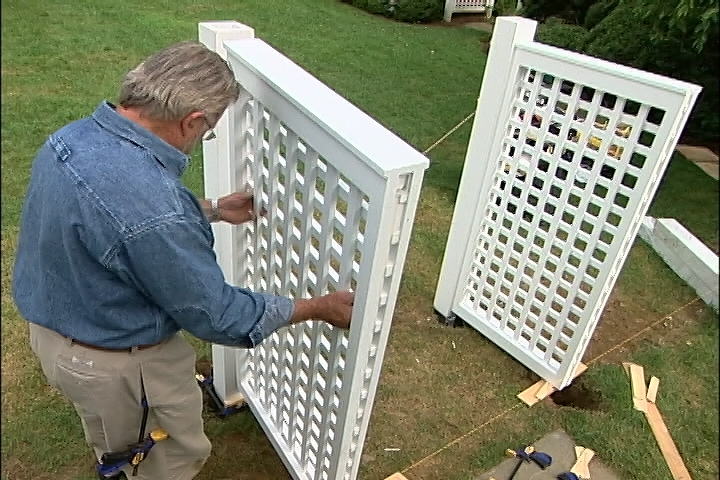 Drill starter holes at each corner and cut the opening out with a jigsaw. Reattach the plumbing.